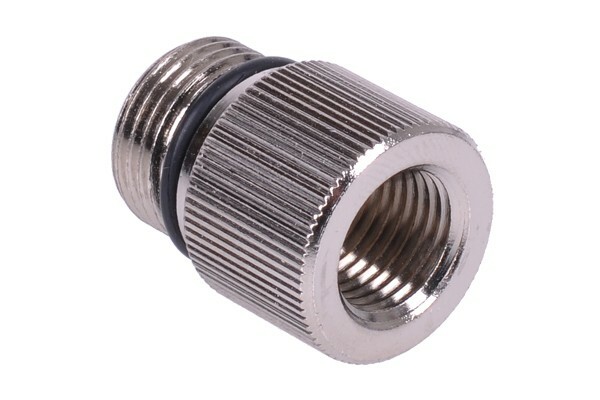 Eheim 1046/48 In- och 1250 utgående adapter till G1/4"
With this 1/4" adaptor it is possible to connect all G1/4" fittings to the Eheim 1048/ pump. The adaptor is simply screwed into the pump instead of the original connector if no push-on reservoir is used. An O-ring gasket is integrated (3/8" to 1/4" adaptor). Please note: Do not insert the adaptor ''dry'' as the O-ring twists when dry and may not provide a safe seal. Therefore please moisten the O-ring before inserting the adaptor to prevent any problems. Important: Over-tightening of the adaptor may result in damage to the plastic shell. If the O-ring has full contact and the adaptor is screwed in hand-tight the seal is already established. Wie lang können die gewinde der anschlüsse sein?